There is a certain phenomenon which has been appearing around the catwalks of the world lately, brought up even more clearly at the New York Fashion Week. Compare the catwalks of Calvin Klein or Alexander Wang to those of Marc Jacobs, Rodarte and Creatures of the Wind, for example. What is the main difference? It’s not the colours or the cuts, its the mood they create. With the first, elegance, straight lines and minimalist fashion rules. With the second, there is a myriad of fabrics and colours and everything seems thrown together, creating a masterpiece almost by accident. 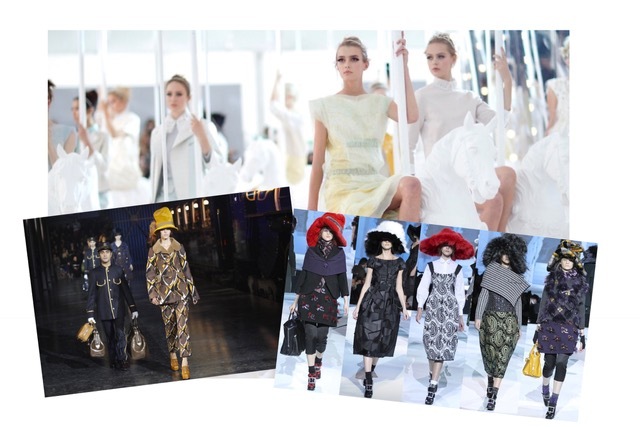 When something seems drôle such as the A/W 2012/13 collection of Marc Jacobs (where this is most prominent) it is a moment for any budding fashionista to make a decision- is this a new avant-garde fashion or a failed collection? The true answer of a such a fashionista should be I don’t know. There is no such thing in fashion as certain styles you have to stick to. With other jobs, you’re meant to go by the book- when it is creativity you’re judging, what can you comment on? Only the way it makes you feel, and if you want to wear it. For me, the collection brought forward the idea of the Ascot dress-up of a five year-old, playing among her grandmother furs in the wardrobe, trying on the hat and the pearls. I have a friend who wears oversize fur coats in unimaginable colors. Its not just that fashion has to make you look good- fashion has a history, which is usually very personal to each designer, the same way as our history and our memories are usually preciously cherished and rarely seen. So when a designer goes against all that and puts his head on the guillotine of fashion critics, should we not congratulate him? He releases our memories and dreams with his own- our yearnings, places and people we’d want to go back to, usually just our former or dream self. This is the second collection this year which truly releases a woman- first, with the hyper-feminine dream-like carousel and pretty princesses perched on painted horses at Louis Vuitton S/S12, then the mystery of that hidden face under the wide brimmed hat at Marc Jacobs A/W12 and the enormous printed coats at Louis Vuitton A/W12- so bold that yes, we would actually stand out in the street. This also brings on a different reflection- what has pushed the designer to bring back those kind of inspirations, not just the ones pulled out of dusty tomes on art and fashion history? My guess would be the emerging group of girls, not women, who bring back the innocence and fun in fashion. Dakota and Elle Fanning. Hailee Steinfield. Normal girls, who with their acting skills and inventive personal styles decided that practical is boring, and that if they can wear anything they want, then why not wear the things which make them smile? Elegance and taste in fashion are unfortunately seen as something which doesn’t exactly go hand in hand with fun. 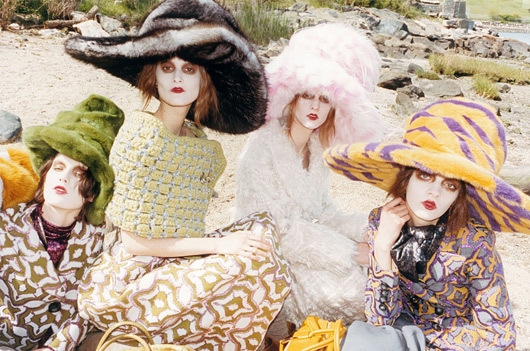 If Marc Jacobs or Rodarte did minimalism, where would the creatives of tomorrow go to for help? Who would allow them to not be so scared of fashion and their on-the-edge careers and breaks, if not people who are not scared of the world and fashion itself? Although it has now been two years since his passing, one such worthy candidate would have been McQueen. Both fun and elegance were putty in his hands. He moulded them into his clothes, season after season. The women he dressed felt powerful and majestic in his clothes, and they didn’t take dressing as just cuts of clothing- they saw it as a true, creative and fun art. That is why Alexander McQueen left such an impression on the fashion world- he put his heart and soul into his work and creating the shows. He really did create visions, and the same is now with Marc Jacobs. He is more fun in the obvious sense, but he has a similar thought process to the late McQueen- don’t just give people what they want and expect, but go further, into your own mind and surprise them. Because nothing helps more in the fashion world than a spectacular surprise that takes away the breath of the viewers and trasnports them into the mind of the designer.